Often leadership comes in the form of enabling and empowering others to make change in the community. At Rose Community Foundation, one of the ways we do that is through charitable funds. We currently manage more than 100 such funds which have been established by individuals, families and groups as a way to make a difference for causes they care about. Many of the funds we oversee are involved in grantmaking, where fund owners direct donations to nonprofits and causes of interest. Other funds, however, are more programmatic in nature, such as the Jewish Women’s Fund of Colorado (JWFC). The JWFC, a fund co-founded in 2005 by Melodye Feldman, Lynda Goldstein and Nancy Reichman, operates programs designed to empower Jewish women in Greater Denver to create systemic change in their lives and community. In addition to the Fund’s other work in the community, its signature program, Transforming Conversations, is a 10-session workshop that aims to provide women with knowledge, tools and strategies to make informed choices and take on leadership roles in the public, private and social sectors. More than 35 women from a diverse range of fields and backgrounds have participated in Transforming Conversations, including Melanie Gruenwald and Melissa Hoch, both directors with the Robert E. Loup Jewish Community Center. 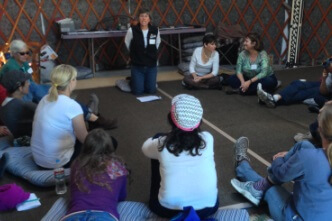 Their experience was the impetus for creating a Jewish women’s retreat in 2013. Gruenwald and Hoch’s retreat was a huge success, drawing nearly 100 women representing every decade, from teenagers to 70-year-olds. They are two examples of how this particular fund seeks to have an impact on the community, and this fund is an example of how Rose Community Foundation is helping passionate people make a difference. Are you passionate about a cause such as leadership or empowering women? We can help you explore ways to make a difference in the community. Contact one of our philanthropic advisors today at 303.398.7459.